As far as the weekend club player is concerned, golf has changed very little in the past century. The elite tour players may have evolved, with leaner waist-lines, longer drives and heftier bank balances. However, the only real change for the weekend warrior, competing in the monthly medal, might be the dramatic increase in the number of hours it takes to play golf. The corresponding reduction in our free and disposable time poses serious questions for golf. Which is where the debate about the future of the amateur game gets interesting. Will golf sustain as a whole-day event? Will it continue to attract parents of young families, or hard working people short on leisure time? What role can technology play in a sport which still leans on paper scorecards, stubby little pencils and finding out the results of your event two days after the fact? This is exactly the conversation that spawned VoxGolf, a start up tech business founded in Dublin in 2015. VoxGolf is a competition platform, where players enter games, submit their score and view a real time leaderboard on the smart phone app, free to download on iOS and Android. The company can run centrally organised games from VoxGolf HQ, or provide the platform to clubs, groups, societies or even the travelling tour party who wish to run their own games for members and guests. The flexible and modern design of the software is ideally suited to shorter, more fun formats of golf over 6 or 9 holes or as add-on competitions to your full 18 hole rounds. Currently, the company are making a splash with the VoxGolf Major 9 competition. For a €5 entry fee, payable in the app, players can compete over 9 holes at any course in Ireland. 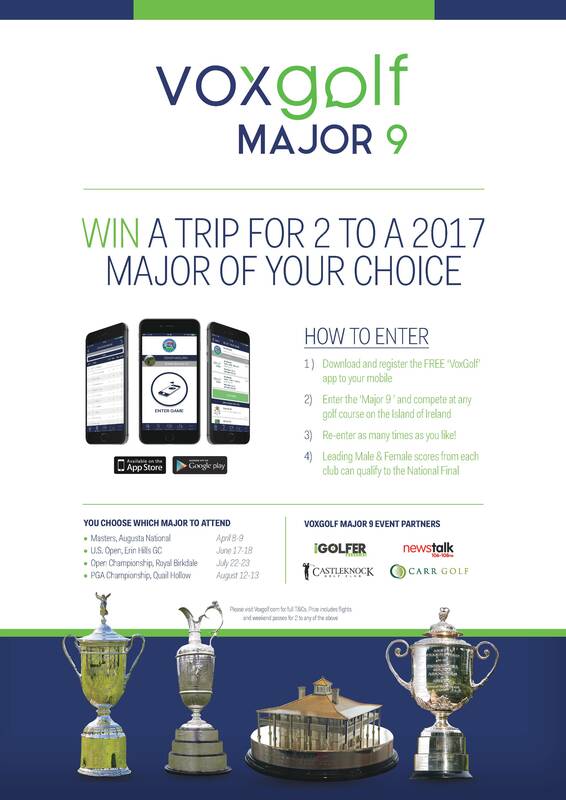 Qualifying is open until March 17th, after which the top 70 male and top 70 female golfers will be invited to the Major 9 Final. The final shoot out takes place at Castleknock Golf & Country Club on March 26th. The best part? The winner walks away with a trip for 2 to a Major of their choice. Our dusty old game could be in for an innovative shock to the system from this Irish start up. Watch this space! Click here for terms, conditions and rules.